Thirty years at OSU and I can say that not a single day has been uneventful. Walking across campus after an interesting symposium I came upon a large circle of students playing wooden flutes. 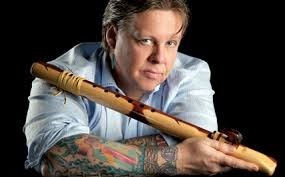 They were past students from Jan Michael Looking Wolf ‘s course Native American Flute (MUS108) at OSU. 350 students joined to play "One Heart" in what may be a world’s record for the most wooden flutes at one time. Looking Wolf has submitted the event to the Guinness Book of World Records. For your joy, here is my video of that magic moment.